It might have been the jet-lag talking, but the first words that come to mind when describing Bled, Slovenia are beautifully surreal. One day I was jumping on a jet plane in drought-plagued, palm-tree-filled Los Angeles and the next I was twiddling my toes in the clear alpine water of Lake Bled, leisurely paddling my way toward a medieval church. It was if I had been suddenly dropped into a jigsaw puzzle. I’ve already described my hectic train trip to Bled, but once we stepped off the bus in the tiny town square our pace slowed.Throughout my journey in Slovenia I found it very hard to hurry. Far different from the frantic pace of sightseeing in France or even Italy, most of the sights in Slovenia are best seen at an amble, preferably with a cone of gelato in hand. Needless to say, I’m a fan. Bled is a tiny alpine town, about one hour’s train ride away from the Austrian border town of Villach. It is packed with British tourists, British university students, and an assortment of other visitors from around the globe. There are a number of recommended hostels including Hostel Bled, where we stayed. At first I was a little worried that I had booked us in an HI hostel (that’s a rant for another time) but we were very relieved when, two minutes walk from the bus station, we found the Hostel Bled sign above a friendly basement bar, which also served as a reception desk. The dorms were clean and cozy, the kitchen was excellent, and the water was (scalding!) hot. What more could I ask for? The people were very nice and one of the men working there enthusiastically drew a map for us with all the sights around town we shouldn’t miss as well as the swimming spots closest to the church on the island. There were boat tours to the island, he said, but they were 11 Euro per person. If you didn’t care about seeing the inside of the church, swimming was a better option. We, the cheapskate travelers heartily agreed. That evening I turned in pretty early, but in the morning we were up early and ready to begin exploring. Our first stop was to the grocery store around the corner to grab supplies for the day. I picked out some yogurt with Twix pieces mixed in for breakfast (Mo found some with Smarties) and we got bread rolls, cheese, salami and a packet of mayonnaise for lunch. Eastern Europe was so thoughtful to package their mayonnaise in small foil packets and tubes–they must have known how much Mo and I love mayo and what a waste it would be for us to buy a new jar in every city. Lunch fixings in hand we first headed up to the castle. 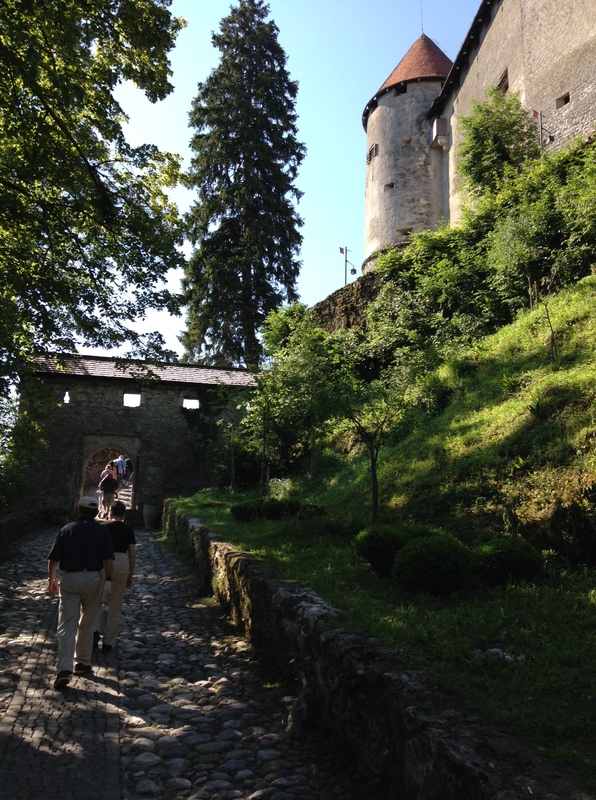 Warned by Rick Steves that the inside of the castle was a little bit of a letdown, we decided to explore the outside instead. There was a great trail that led to beautiful panoramic views. 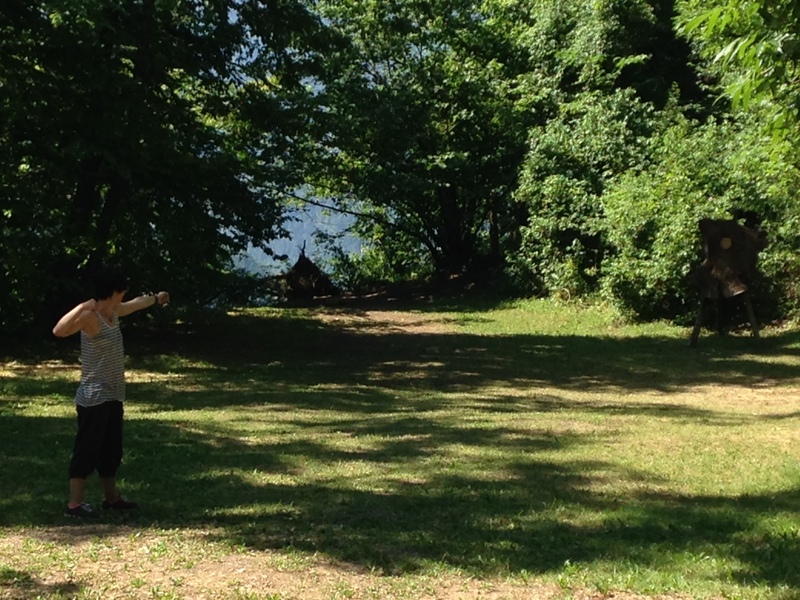 My personal favorite aspect of the castle was the archery range at the base of the walls. I would have loved to shoot there, although I have a feeling most of my arrows would have gone soaring off into the lake below. For all you history/castle nerds out there (like me!) Bled castle was first referred to in 1011 (no one really know when it was first constructed) and is the oldest castle in Slovenia. The current castle is very Medieval/Renaissance, as were the re-enactors we saw trudging up the steep castle hill on their way to work. The placement of the castle on a towering cliff above the lake is breathtaking and looking back I’m very disappointed I didn’t get a better picture of it. 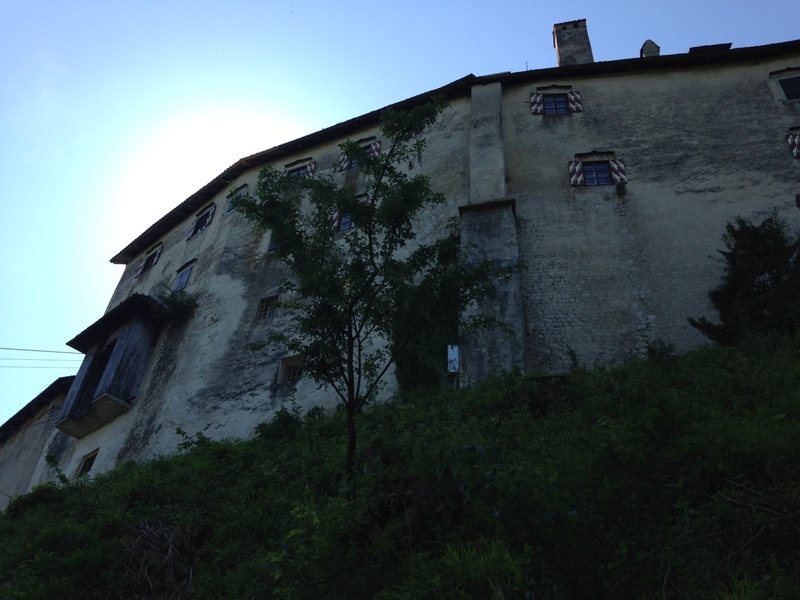 Looking up at the castle– it was quite impressive! The view! Oh the view. How can a lake be that blue? After the castle we started walking east around the lake, passing a number of Soviet-era hotels and rows of designer shops and fancy cafes. We passed Tito’s Villa, the former summer home of former Yugoslavia’s former leader which now a four star hotel with a ridiculously expensive cafe, and found a nice spot of grass next to the lake. After sunning a few minutes we hopped into the water. I was surprised it wasn’t freezing, but Bled is shallower than the other lakes in the region and therefore the water is warmer than I would expect from an alpine lake. 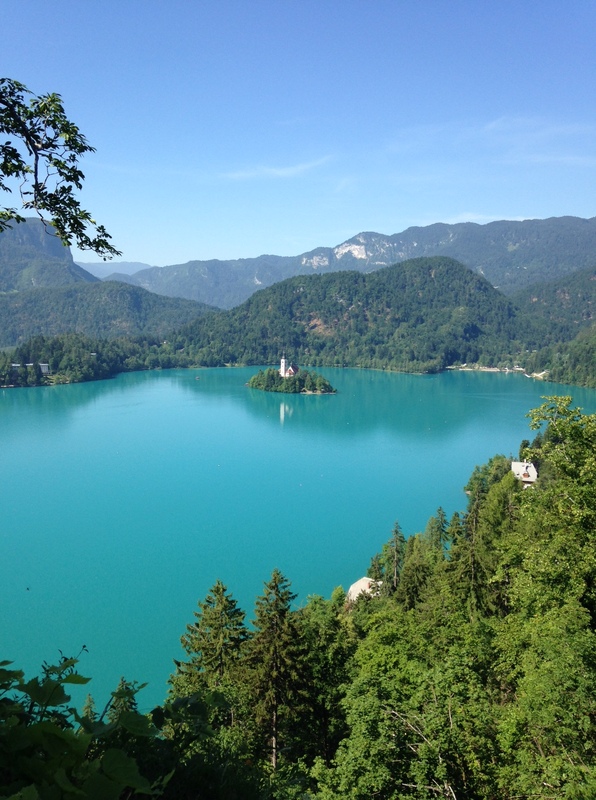 The water of Lake Bled is so blue it almost doesn’t seem real. There are concentric circles of warm and cold water radiating from the center of the lake, but even the cold currents are refreshing, not freezing. We took our time swimming out to the island. The center of the lake is the ideal spot to see the forest marching down to the lake edge on all sides with the alps towering above. A few peaks still had a little snow on them, even in June and the whole little town feels very small and secluded from the rest of the world. Ringing the bell in the Church of the Assumption on the island is supposed to be a good luck and so it rings continually across the otherwise silent lake, just adding to the time warp aura of the place. There are no power boats allowed on water so the middle of the lake is perfectly calm and totally quiet. It took us about twenty minutes to reach the island dock and pull ourselves up to dry out and rest up before our swim back. We climbed to the top of the stairs to peek into the courtyard, but we felt a little odd about roving a medieval church courtyard in our bathing suits so we didn’t stay long (a note: the church won’t let you in with only your bathing suit on so if you want to see the inside of the chapel, take a boat!). The swim back was lovely, as was the walk back along the edge of the lake. After months of planning and worrying and frenzied excitement I could finally feel my shoulders settling. I think some part of me had expected my trip to Central and Eastern Europe to be a lot like my previous trips to Western Europe– a mad dash around sights punctuated by moments of peace. But what I experienced in Slovenia was all peace, with the sights quietly waiting in the wings until I was relaxed enough to appreciate them. Honestly, after all the major life changes in the past year, it was just what the doctor ordered. 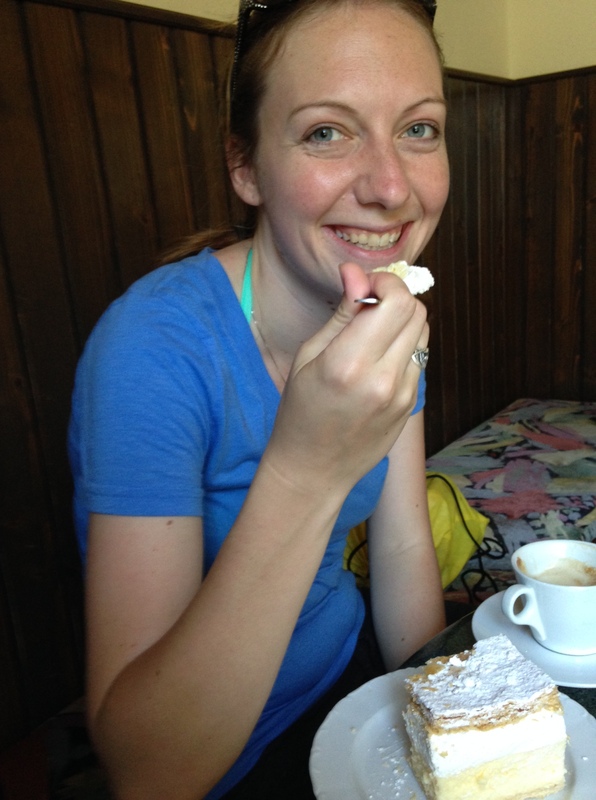 Back in town we decided we needed a little afternoon snack before tackling our next objective and stopped at a darling unpronounceable cafe called the Slačičarna Šimon to sample the other thing Bled is famous for besides a church in a lake– Kremna rezina, or cream cake. The cafe was adorable, with faded sports team photos on the wall, flowered tablecloths and classically outdated music playing. Slovenian cream cake consists of a layer of fluffy custard and a layer of whipped cream sandwiched between two layers of puff pastry and drenched with powered sugar. It is heavenly and I was very sad to learn that it was primarily a Bled delicacy– I would have eaten every day of the trip if I could have! 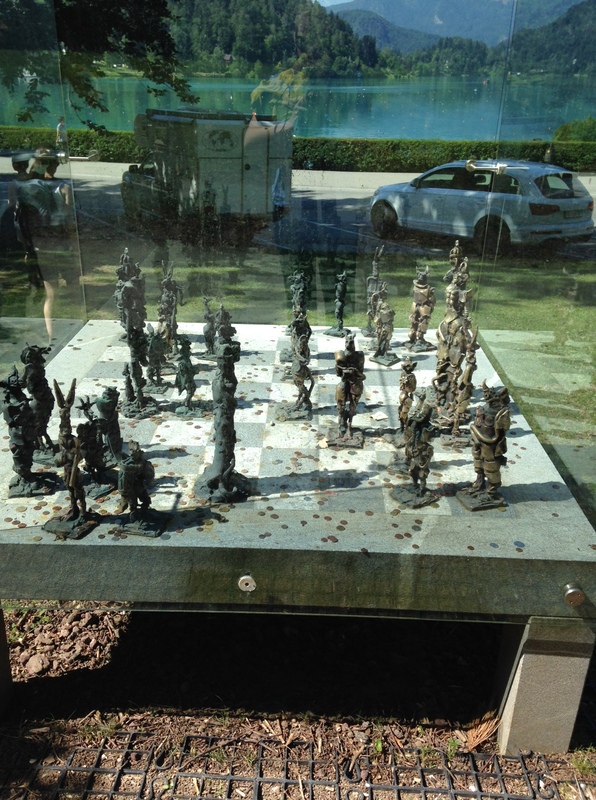 And interesting modern statue commemorating the 35th Chess Olympiad– apparently Slovenia is very proud of its many chess players, mathematicians, and scientists! 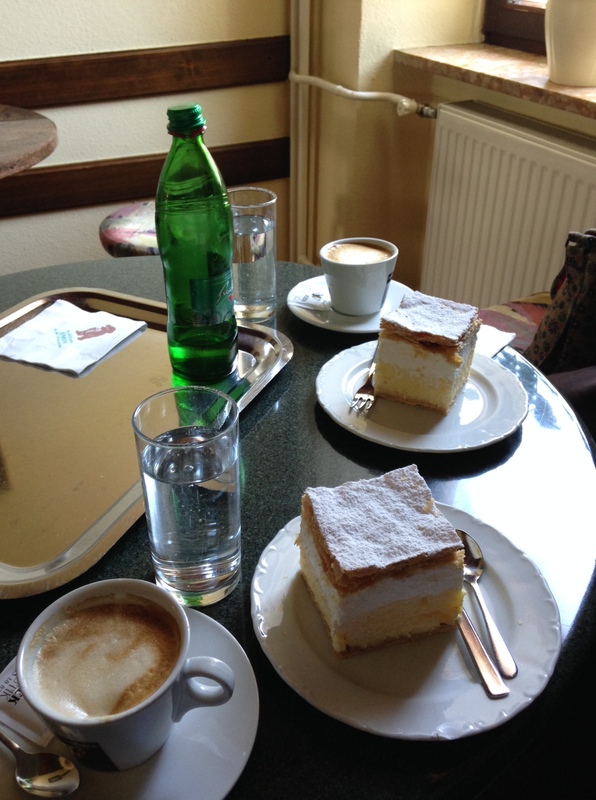 Cream cake and cappuccinos– the ultimate afternoon snack. Posted in Places I Go, Weekly Awesome.Tagged adventure, hiking, journeys, swimming, travel. 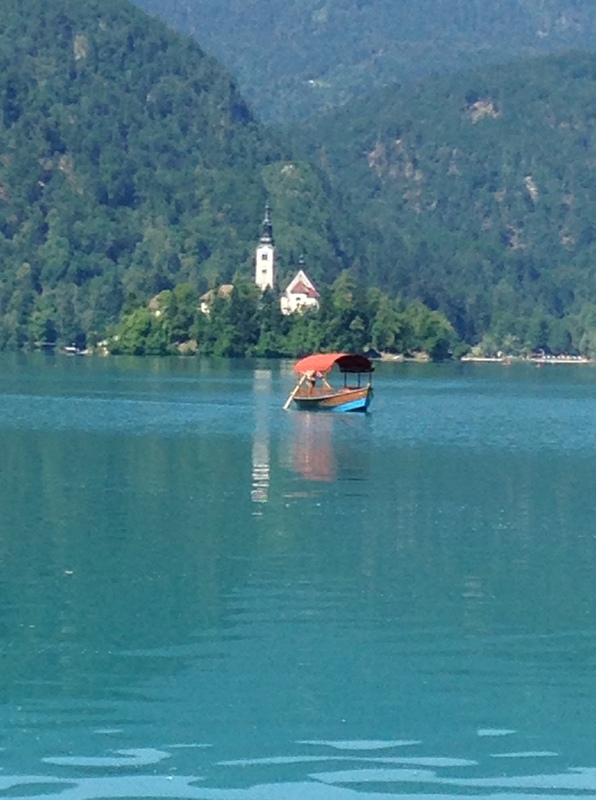 Ahhhh, Lake Bled! Such a darling place. You captured it perfectly!